What was your favourite summer treat as a child? We had Dairy Queen soft serve, hard ice cream, fudgesicles, popsicles and creamsicles that I can remember! My very favourite was always Dairy Queen. Because I had very cold-sensitive teeth, Dairy Queen was nice because it was easier to eat, but when that wasn't available, creamsicles were my next favourite. I've always loved citrus flavours. 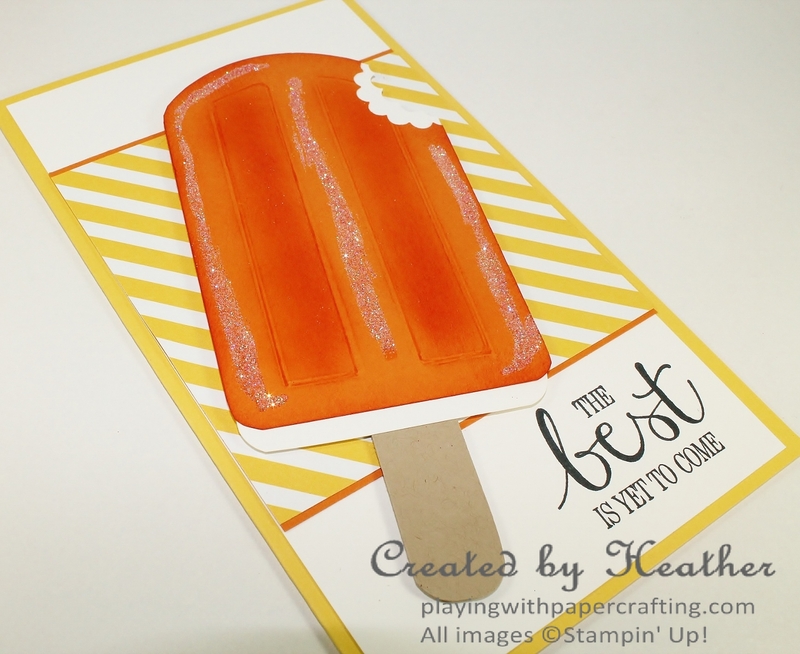 When I saw that The Paper Players had a Clean and Simple Summer Treats as a theme, this is the first thing that came to mind, although it did require some head work to figure out how to make one. 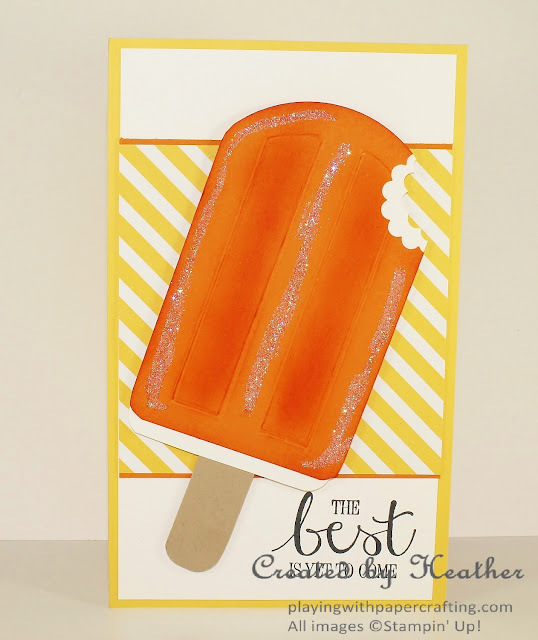 When I finally had a Creamsicle I was proud of, I was aghast to find that it barely fit on a standard sized card! I wasn't going to start again, so I simply made a non-standard-sized card base of Daffodil Delight to mount it on. This one measures 7" x 4 1/4". I'll have to use my Envelope Punch Board to make an envelope that will fit. To make the creamsicle, I cut a piece of Pumpkin Pie cardstock to 2 3/4" x 4 1/2". I then rounded off one end of it by passing that end through the middle of a Circle Framelit so it would only cut the end. I used the Corner Rounder Punch to round off the other two corners. I took it to my Simply Scored Scoring Tool and, aligning it with the short rounded edge at the top, I scored at 3/4", 1 1/8", 1 5/8" and 2 1/4". The score lines started at 3/4" from the highest point of the top down to 4" for the two outside lines and from 1/2" to 4" for the two inside lines. I turned it 90 degrees counter clockwise and scored between each set of lines along the 4" mark. The top lines were scored with the creamsicle in my hand using the stylus to just join each pair of lines with a curve. You can see the score lines in the picture to help you. I sponged between the lines and on all the edges with Tangerine Tango ink, and using a ruler, I used a Pumpkin Pie Stampin' Write Marker to outline the scores as well. The bite is made with a 1 1/4" Scallop Circle Punch. I backed it with a slightly narrower piece of Whisper White, but I punched the bite before I added the white and then punched the white, slightly offset to show the yummy white ice cream inside. I also let about 1/4" of the white show at the bottom. To do this, I cut the Whisper White piece in half horizontally and separated the pieces a bit. Dazzling Diamonds Glitter was added using a 2 Way Glue Pen to simulate the frost on the outside! The sentiment is from the Best Thoughts Stamp Set. 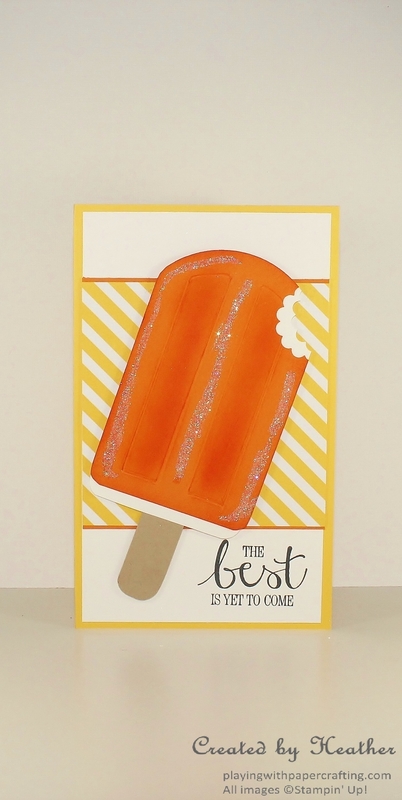 The DSP in the background is from the Brights Designer Series Paper Stack. "Why would I want to join Stampin' Up!?" you ask. And my reply is, "Why would you NOT want to join Stampin' Up!?" If you had planned to spend over $100 on all the new and awesome products in the new Annual Catalogue, then you should sign up. You have nothing to lose and lots to gain. You can get your products at a minimum 20% discount! You can join a network of wonderful people who love to do what you love to do! You can have early access to new products! You can earn stamp sets and MONEY! If you don't want to sell and you don't make your minimum for the quarter, you simply drop. You can sign up again at any time with the same up line, and if you are a dropped demonstrator, we welcome you back! In fact this is a pretty great deal to get back in! But don't wait too long! There's only a few days left in June! Or you can contact me with your phone number, and I'll help you through the process. Will you be the next member of my Papercraft Cat team and earn two free stamp sets?? I hope so!